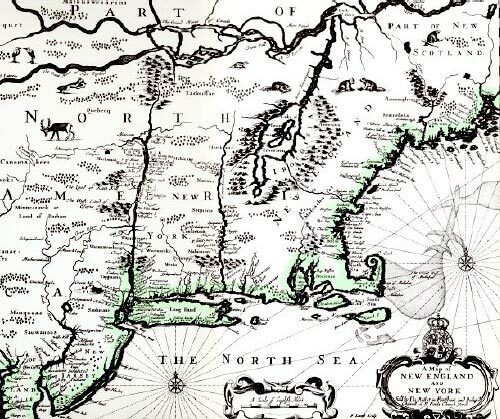 By 1600 the English were becoming interested in a region they had previously ignored, the region between New Jersey and Maine that they called North Virginia. In the space of a few years, most of it would be transformed into the second primary English settlement in America, New England. The voyage of Bartholomew Gosnold was the first attempt to establish a colony in the region. Privately financed by the Earl of Southampton, Gosnold sailed for New England in 1602 with twenty would-be colonists aboard. A colony was established on Cuttyhunk Island, a very small island south of modern New Bedford, Massachusetts. A good defensive site, the island was hopelessly inadequate for a colony, which quickly failed, largely because of Indian hostility. Nevertheless, the English continued to be interested in this apparently fertile land. Gosnold named both Cape Cod and Martha's Vineyard, the latter after his mother, a name originally applied to a nearby island, and the former because "here we found excellent Cod." Gosnold was later one of the organizers of the Virginia Company and captain of Godspeed, one of the three ships that took settlers to Jamestown (see page 48 in the book). Three years after Gosnold, another English navigator, George Waymouth, sailed up the St. George River, in Maine, on a voyage intended to find the Northwest Passage. He did not find it in the Maine countryside, but he was impressed by the fertility of the land, and thus in 1607 the new Virginia Company established a little colony led by George Popham around Fort St. George at the mouth of the Kennebec River. This lasted only one year and was abandoned after an exceptionally hard winter, similar to that the French had found so difficult on this coast at much the same time just slightly farther to the north (see page 45 in the book). The site of Fort St. George was located as recently as 1997. The principal explorer of the region in the years before the establishment of permanent colonies was also an Englishman, although he was working at the time for the Dutch. This was Henry Hudson, one of the most persistent at trying to find a route to Cathay and also one of the most experienced navigators of his age. 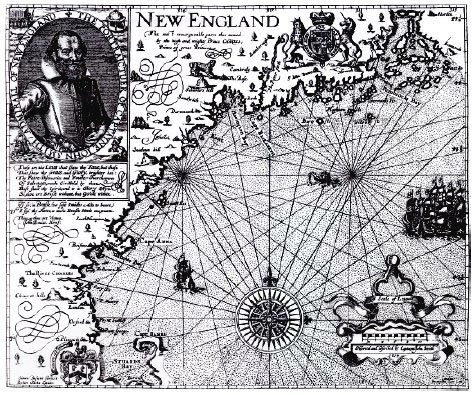 In 1607, at the instigation of the English Muscovy Company, he had attempted to sail over the supposedly ice-free North Pole to the East. The next year he tried to find a Northeast Passage; he got as far as Novaya Zemlya, north of Russia, but, once again, found no usable route. In 1609 he was invited to try once again towards the northeast by the Dutch East India Company, but this time his crew mutinied (he had language problems; his crew was Dutch) and instead, on his own initiative, Hudson decided to sail west and look for a Northwest Passage. He had reckoned without his mutinous crew, who insisted he try farther south than he had intended. Thus it was that in the summer of 1609 Henry Hudson in his ship Half Moon was probing the inlets of the east coast of North America for passages to Cathay. Hudson sailed as far south as North Carolina before turning north. He did not enter Chesapeake Bay to visit John Smith, probably because he was in the employ of a foreign power, but he did note Delaware Bay. To the Dutch this became the South River. On 10 September Hudson thought he might have finally found what he was looking for. Entering the narrows found by Giovanni Verrazano eighty-five years before, he found a spacious harbor. This was New York Harbor. He then entered a large channel, which turned north. It was the river that would later be known as the Hudson River. The Dutch called it the Noort Rivier, the North River. On 12 September Hudson entered his river, trading "Oysters and Beanes" from the natives. Two days later he reached "a Strieght between tow points" where the river is a mile wide. This was the Tappan Zee, a considerable widening of the river that must have encouraged Hudson to think he was on the right path to the South Sea. Hudson sailed 150 miles up the river, as far as today's Albany, and sent boats out another 25 miles. But it was only a river; the boats "found it to be at an end for shipping to goe in." There were mere seven-foot depths, and so Hudson, no doubt reluctantly, turned back. When Hudson returned to Europe later in 1609 he stopped first at the mouth of the Thames in England. Here he was arrested by an annoyed government for "voyaging to the detriment of his country." Indeed it was to England's detriment; soon after the Dutch New Netherlands Company capitalized on Hudson's findings, claiming the whole region for Holland, and Dutch fur traders were soon making the voyage west. One such trader was Adriaen Block, who in 1614 found Manhattan's East River. He had lost his ship to fire and built a new one from the trees of Manhattan Island, and the new ship was blown one day into the river. Calling it Hellegat -- "Hell's Gate" -- because of the tide rips, he sailed through it and found Long Island Sound beyond. Sailing around the eastern tip of Long Island he was the first to realize that it was an island, and, of course, he claimed it all for his country. He also found an island off the tip of Long Island he called after himself, Adriaen Block's eylandt, today just Block Island. New Netherlands was the province of the Dutch, under first the New Netherlands Company and then the Dutch East India Company, until 1664, when control was wrested from them by the English. Map 63. The map of New England from Cape Cod to the Penobscot River that appeared in John Smith's Generall History of Virginia in 1624. The original grant of Virginia by James I in 1606 defined it as extending from 34° to 44° N, which included most of New England. The map was drawn by Simon van der Passe from John Smith's 1614 explorations and went through many editions; this is an early one. Little detail is shown beyond the coastline; Cape James (at bottom) is easily recognizable as Cape Cod. The latter was first named by Bartholomew Gosnold in 1602 on account of all the fish he found there, and it was renamed Cape James by Prince Charles (later Charles I of England) at Smith's request. The original name was the one that prevailed. One of Smith's names did endure, however -- New England. At the same time that Block was sailing around Long Island, Captain John Smith of Virginia fame (see page 48 in the book) made an exploratory voyage to the region. It was, in fact, Smith who seems to have coined the name New England to replace Norumbega, the name by which the region was previously generally known, a name Smith no doubt thought sounded too Spanish. Other names were deliberately anglicized; the English king, Charles I, confirmed the name New England, and "did change the barbarous names ... for such English, that posterity may say, King Charles was their godfather." It was an attempt at civilization by nomenclature; with familiar-sounding names, colonists might more easily be induced to settle. Map 64. 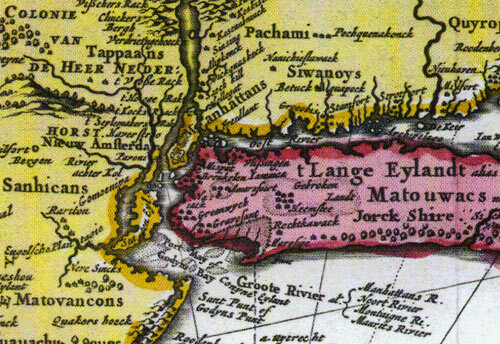 New England and New York, 1627, by English mapmaker John Speed, published in his Prospect of the Most Famous Parts of the World, the first general atlas produced in England. New York at this time referred to the country between the Connecticut and Hudson Rivers; the Dutch were still ensconced in New Amsterdam and claimed much of the lands here apparently attributed to England. You would hardly know from this map that the Dutch had any presence in the region at all. The large lake in New England is Lake Champlain, drastically misplaced towards the east. Noted by Samuel de Champlain in 1609, it had been incorrectly located on his 1613 published map and simply copied, mistakes and all, by Speed. The interior of New England was relatively unknown in 1627, but was about to be explored by colonists wishing to expand their horizons (see page 62 in the book). Smith explored the coast as far north as the Penobscot River, with his eye on the resources that might be of use to settlers. 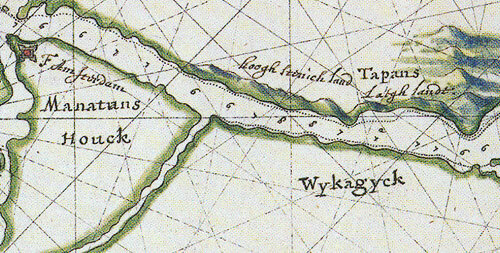 He wrote that the coast of Massachusetts had in some places "Quaries of stones" that were "so strangely divided with tinctured veines of divers colours: as Freestone for building, Slate for tyling, smooth stone to make Furnasses and Forges for Glasse and Iron, and Iron Ore sufficient conveniently to melt in them." And soon the settlers would come, in 1620 creating the first permanent English colony in Smith's "New England." The first Europeans to reach America sought a route through the unknown continent to the riches of the Orient -- the fabled "passage to Cathay." This search would motivate traders, foreign governments, glory-seekers, and private investors for the next three hundred years. As they explored the coasts and penetrated the interior of the continent, often with the help of native information, they slowly mapped the land. Geographic myths persisted. Was there a River of the West? A great sea occupying half the continent? Where was the Northwest Passage? Some chased rumors of cities paved with gold; others sought souls to convert. Here are all their fascinating stories. Whether colonizers or railway surveyors, missionaries or scientists, they were all explorers, and their exploits almost always had political ramifications. By filling in the map of North America they influenced the course of history and ultimately changed the map of the world. Dreams of gold, imperial aspirations, and an economic imperative. These factors drove Europeans from late in the fifteenth century to risk their lives exploring the uncharted coastline of North America, then penetrating -- and eventually occupying -- the mysterious and to them unknown interior. America Discovered reveals how, piece by piece over centuries, explorers filled in the map of the "other land" encountered by Columbus in 1492. It confirms through graphic evidence how they were aided by the indigenous people whose territory they were claiming as their own. Besides acting as guides, Native Americans provided valuable geographic information about what lay beyond -- although their reports were sometimes misinterpreted, often with intriguing results. Using more than 280 original maps and dozens of historic illustrations, this remarkable atlas shows how geographical myths such as the Northwest Passage and the River of the West were slowly shattered. How rumored "seas" became great lakes, how apparent islands (such as California and Alaska) were found to be peninsulas, and how the full extent of the continent was finally revealed. From famous explorers such as Lewis and Clark to others more neglected by history, America Discovered tells the fascinating story of the men who put North America "on the map." Derek Hayes trained as a geographer at the University of Hull in England and at the University of British Columbia. For many years he has traveled the world collecting and researching historic maps. America Discovered: A Historical Atlas of Exploration is part of a series of highly acclaimed, award-winning historical atlases he has written and designed, which include the Historical Atlas of the Pacific Northwest, Historical Atlas of the North Pacific Ocean, Historical Atlas of Canada, Historical Atlas of British Columbia and the Pacific Northwest, and the Historical Atlas of the Arctic. © INTERESTING.COM, INC. CONTENT MAY BE COPYRIGHTED BY WIKITREE COMMUNITY MEMBERS.